Warning: This post will have “city girl” written all over it. I didn’t work on Sunday or Monday for obvious, logistical reasons, but this week still seems like a two-day work week — because I had so. much. fun. on assignment on Tuesday when I followed a pre-season trout-stocking trip. © 2011 by The York Dispatch. 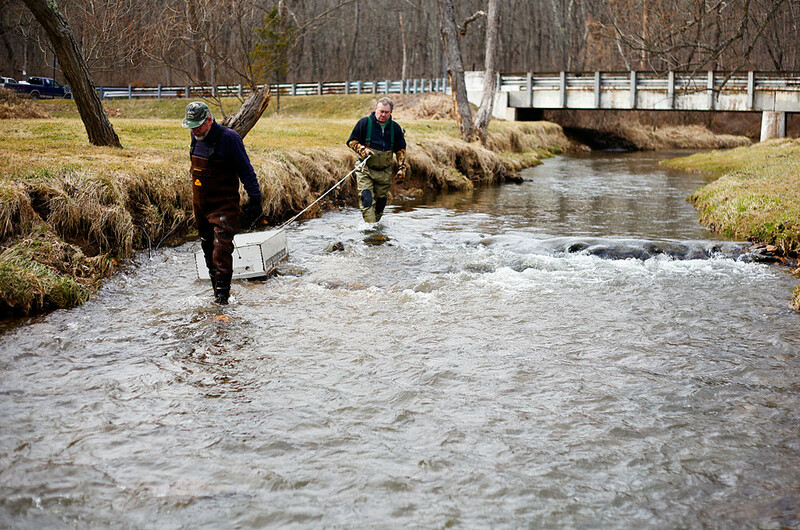 Charlie Meads of Hallam Borough releases trout in Fawn Township on Tuesday, March 8, 2011. During each trout-stocking trip, the caravan of trucks tries to stop at least four times per mile per creek to release fish, provided there is enough road access to that creek. Volunteers from three different York County fish co-ops helped Waterways Conservation Officer Darrin Kephart and Jay Bucher stock several public-access creeks with 3,000 young trout as part of the pre-season live-release procedure. The fishing season opens on April 2. I’ve been fortunate to do and see a lot of cool things in my relatively young life, but I’m not kidding. This was easily one of the neatest things I’ve ever covered. There was one big fish-tank carrier truck, followed by the Waterways Conservation Officer and a caravan of almost a dozen pick-up trucks driven by volunteers (most of whom are older and retired). Several creeks were to be stocked with young trout that day, so the access points were planned in advance according to which landowners gave permission. And each time the caravan stopped at an access point, they’d scoop the fish out of the truck and either dump them into the creeks via buckets or carry them out via float-boxes. Riding in a truck, hopping out and photographing people putting fish in a creek may not seem very glamorous or interesting to a lot of people, but I was truly and honestly fascinated by the whole thing. And, of course, I made a video, so check it out! © 2011 by The York Dispatch. 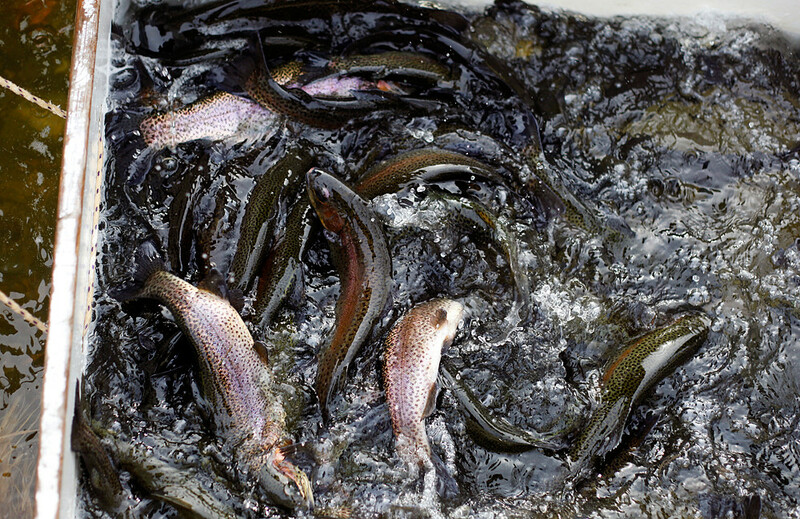 Dozens of trout splash around in a float-box pulled by Rick Leader of Dallastown and Larry Bennett of Stewartstown, who would disperse the fish down South Branch Muddy Creek on Tuesday, March 8, 2011. © 2011 by The York Dispatch. 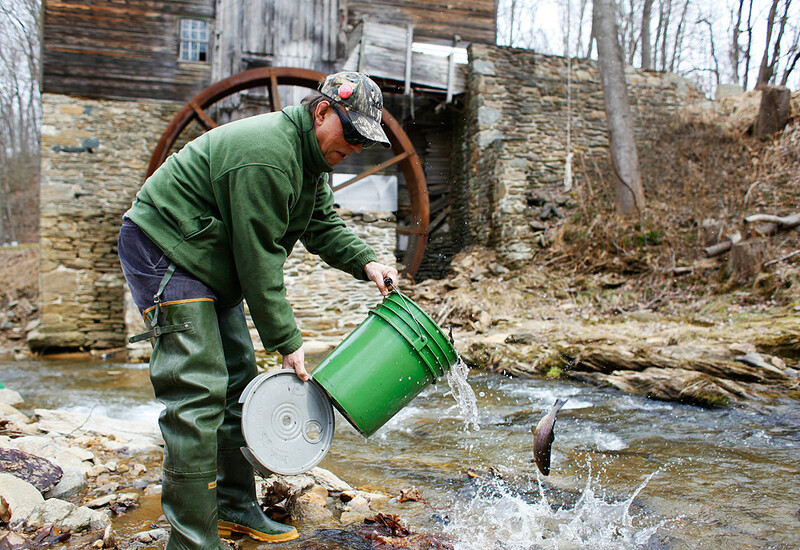 Dean Snyder of New Bridgeville hands a bucket full of young trout to Dennis Leicht of Lower Windsor Township, as Jay Bucher of Shippensburg fishes out more fish with a net in Fawn Township on Tuesday, March 8, 2011. The truck is outfitted with seven different tanks, and can contain up to 3,000 young fish at a time. Volunteers released brown trout, brook trout, rainbow trout and palomino trout. I went along for the whole, four-hour trip. Later, some of the old-timers remarked I’m the first photographer to do so, as photographers in the past have accompanied the caravan for only one or a few stops. I didn’t care, and they didn’t seem to mind. And I’m going to try to accompany them again on another trip — next time, with a pair of waders so I can get into the water with them. © 2011 by The York Dispatch. Larry Bennett of Stewartstown and Rick Leader of Dallastown pull a float-box down South Branch Muddy Creek on Tuesday, March 8, 2011. If a creek has only one or a few good access points from a road, volunteers would wade out for a few miles in the creek to disperse the fish evenly. 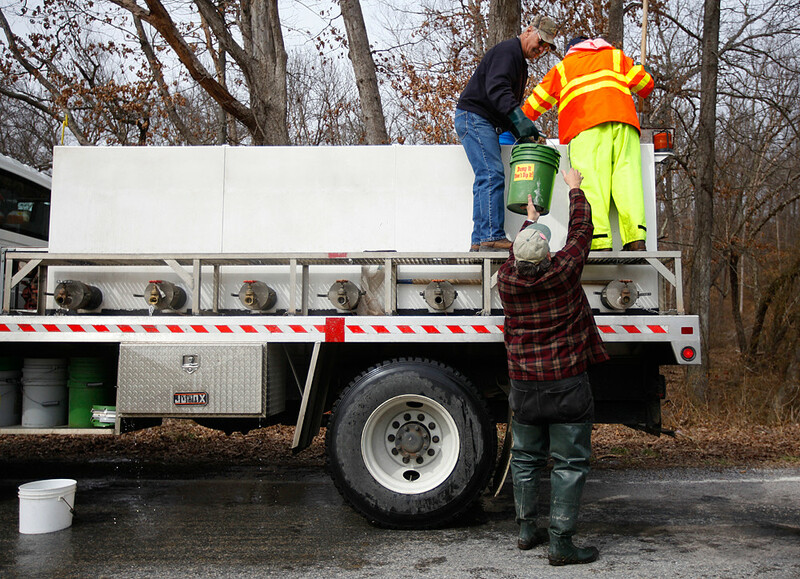 These volunteers were stationed at several points along the fish-carrier truck's route, to be ready to carry the fish out in float-boxes in the creeks.